Background: Liver cancer is the fifth most commonly diagnosed cancer and the second leading cause of cancer-related deaths worldwide. Among the liver cancers, hepatocellular carcinoma has been reported to be responsible for 85-90% of primary liver cancer and it is the second most common cause of cancer mortality with 700,000 deaths documented annually. The major risk factors of HCC include chronic infections with the hepatitis B (HBV) or hepatitis C (HCV) virus, chronic liver diseases, alcoholism as well as dietary carcinogens, such as aflatoxins. Highest incidence rates are estimated to occur in Asia and Africa. Objective: The effectiveness of current man-made agents in treating chronic liver disease is not satisfactory and they have uninvited side effects. Herbal medicines are extensively used all over the world; however, there is still a vast gap in their acceptance by the scientific community. Plants are rich in secondary metabolites and phytochemicals obtained from both, dietary and non-dietary sources. Natural plant products are potent therapeutic as well as chemopreventive agents for numerous chronic diseases like cardiovascular, metabolic, neurodegenerative and neoplastic diseases. 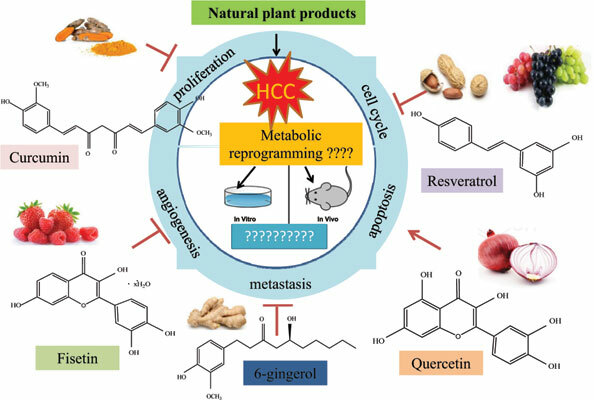 Results: Dietary phytochemicals such as curcumin, resveratrol, quercetin, silibinin, N-trans-feruloyl octopamine, lycopene, emodin, caffeine, urolithin A and Phloretin have been found to be useful for the treatment of HCC and other diseases. According to recent reports 60% of the anticancer medication in current use has been obtained from natural sources. Conclusion: Thus, derivatives from plants have played an essential role in cancer prevention due to their pleiotropic abilities to scavenge free radicals, inhibit cell growth and induce apoptosis. Hepatocellular carcinoma, aflatoxin, nitrosamines, phytochemicals, anticancer, secondary metabolites, pleiotropic abilities.